Usually it’s the ridiculously simple activities that kids like best and this one is no exception. This has been a favourite at our house for over ten years. I know exactly when we started doing it because I remember being over at my friend Julie’s and seeing her son playing it. I was the mom of three boys at the time so I knew instantly that it would be a hit at my house. I was right. The premise is this: boys like cars; boys like mud; kids like play dough. It’s about that simple. 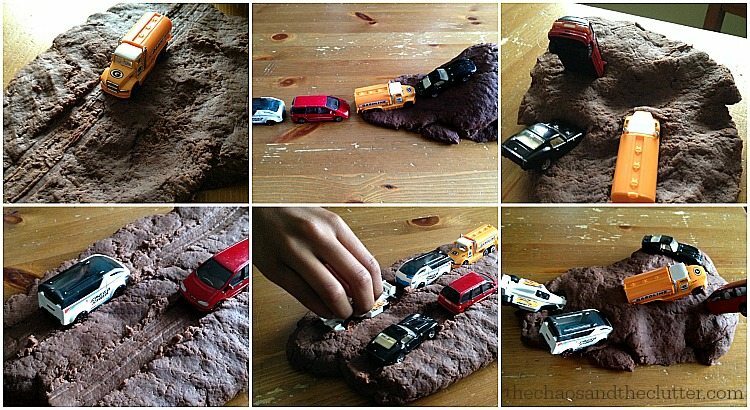 For this activity, you need brown playdough and some cars or trucks. I use chocolate playdough most of the time because I like the scent and consistency. Once you suggest that they pretend the playdough is mud, kids, (boys especially) love to make roads in it, hills and valleys, and of course, get vehicles stuck. Then they can send their tow trucks to rescue the stuck vehicles or extract them via helicopter or whatever their imagination comes up with. We always call this Stuck in the Mud. If I say to my kids, “do you want to play stuck in the mud?”, they know exactly what I’m talking about and seem to enjoy it as much now as they did when they were toddlers. It’s also a great simple sensory idea. I wanted to share this simple activity with you but needed to get a few pictures in order to do so. I tried making my usual chocolate playdough recipe, but I was distracted and missed half a cup of flour plus I substituted hot chocolate mix for the cocoa. The result was that it was lumpy, strange in colour, sticky, and burnt. The pot took forever to scrub because of the playdough burnt to the bottom of it and I was feeling pretty darn frustrated! I didn’t have enough cream of tartar or arm muscles to try another batch, so I did what any mom would do and looked up a recipe for no-cook chocolate play dough. I didn’t like the consistency or look of it as much as I like my usual recipe, but it was way easier to make and the kids didn’t seem to mind. I asked if they wanted to play Stuck in the Mud and Einstein ran off to get some cars! This type of sensory play never seems to get old! If you are looking for other playdough ideas, you may want to follow my Playing with Playdough board on Pinterest. What is your favourite way to play with play dough? 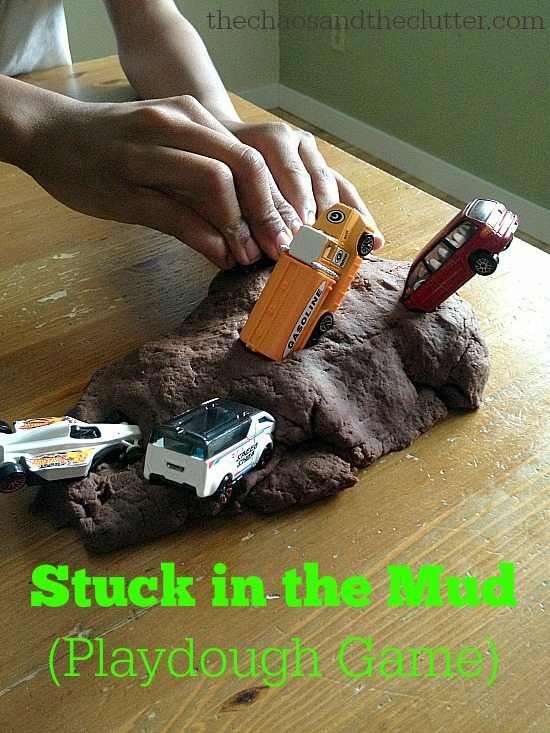 What a fun playdough recipe and I know my kids will love using cars in a new way. Pinned!